Marketing new computer technology to corporations is no longer relegated to computer magazines like Infoworld. Companies are now launching new products on the streets, in public, much like cigarette and soft drink companies did, in the latter part of the 20th century. Times certainly have changed. Recently, in Chicago, IBM had an artist paint grafitti on sidewalks in Chicago to promote Linux. They had some problems with this marketing plan and paint was used, instead of washable chalk. IBM got fined. The City of Chicago wasn't too pleased. But some people heard about it. 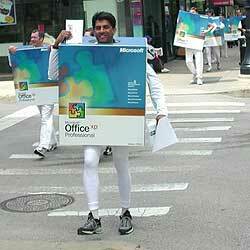 Never to miss a bet, Microsoft did one better and recently blitzed Chicago commuters with their Windows and Office XP launch. 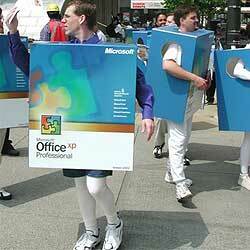 At least a dozen people wearing Microsoft XP boxes were chanting "Are you experienced?" 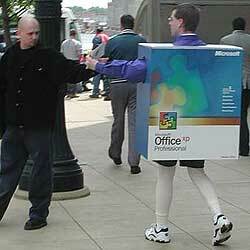 and handing out 30-day trial copies of Office XP. They were also passing out a flyer announcing the Chicago launch event with a keynote by Microsoft CEO, Steve Ballmer, at the United Center on May 31, 2001. Here are some pictures snapped by Senior Editor Stephen R. Jones with his new Nikon 880 camera.